A moment of wonder from Plimouth Plantation Museum. 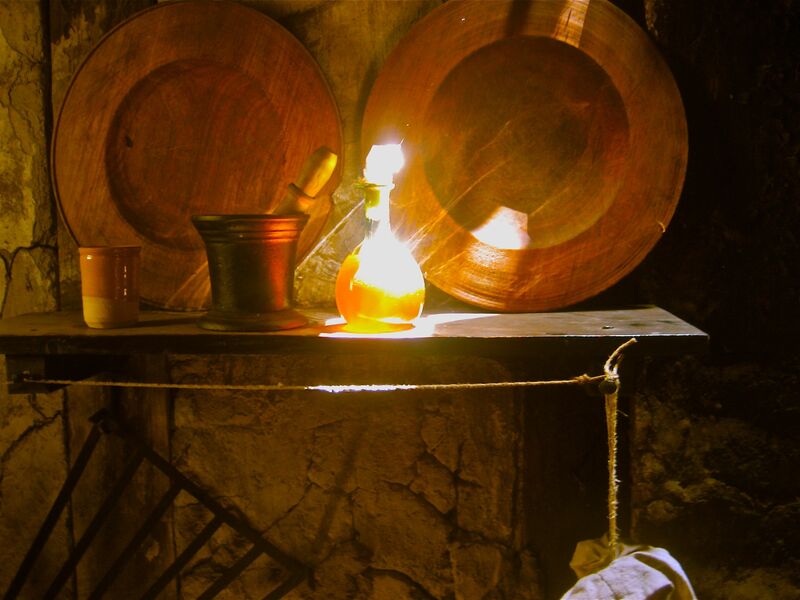 I walked into this tiny cabin, set up to mimic 1629, and this shaft of light was illuminating this oil bottle on the shelf. The sun was coming down the chimney. A few minutes sooner, or a few minutes later, and I would have missed it completely. Fiber, spinning, and some universal truth. Journeying towards the Pace of Peace, which just might be found by them that knows the way, and are willing to teach others … to spin. Ah! This is a remedy I could use! And so Arabella is teaching me to spin, and it is opening up the world for lots of thoughts on lots of things. Like the universe spinning, and shedding urban life, and living closer to the items we wear and the food we eat, and who knows what else? So far, ‘what else’ has included photography, writing, and a new form of spinning — on a potter’s wheel, which has proven to be even more enticing and addicting to me than spinning fiber. The universe is such a curious wonder! I am discovering my place in it. Welcome, sweet friend, to the world of fiber and fun and connection. We’re glad you finally made it! We’re delighted to help you feel at home here! Aha! And so, it begins….what a wonderful door to a wonder-filled world that has been opened before you! Hallelu ! Hey Dad! I added and EASY BUTTON for signing up to get posts by email. Click here to see it! A whole new world! Has NPR done a story on spinning yet? Love your French maiden name! By all Google accounts, you should be drilling holes in craniums rather than spinning my most favorite of wools, merino. Ah, merino!!! So utterly soft!! I shall have to look for some to spin for you! Hi Joyce, in case you’d like to easily follow The Spinning Universe, check out the easy button for getting new posts by email.